One of the Ulysses badges we made for the Abbey Theatre on display in the window of Sweny’s Pharmacy in Dublin. This was where Leopold Bloom bought his soap in the novel by James Joyce. I don’t know if this knitted guy is supposed to Joyce or Bloom but he has good taste in badges either way. I’ve got 99problems but a badge ain't one. Badges and keyrings go together like Jay-Z and Beyonce. If you liked it you should have put a (key)ring on it. 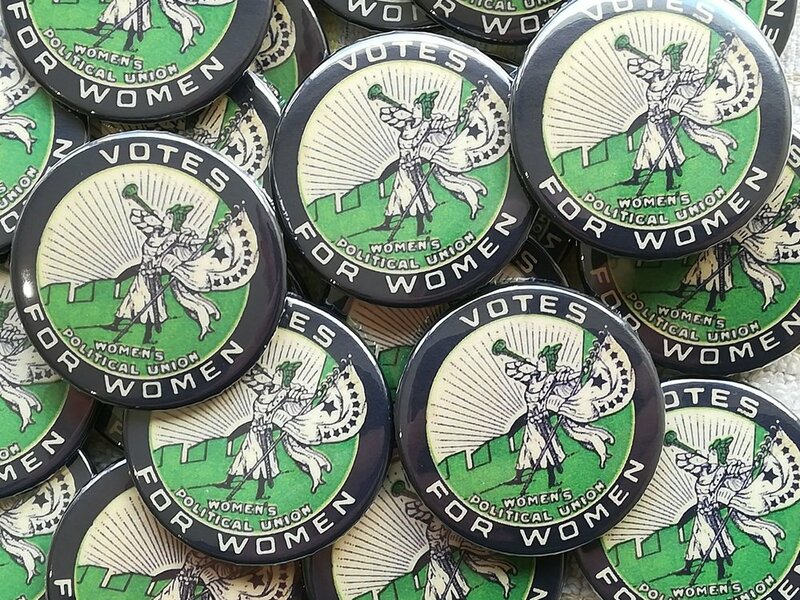 We recently created these badges for a client which use an image from a historical suffrage badge originally produced by the Women's Political Union in the United States. 2018 is the hundredth year anniversary of women's suffrage in Ireland. In December we were also asked to reprint a vintage badge, this one from not so far back, by the Little Museum of Dublin. An image the recreated Switzer's Santa badges we printed for them is below. As someone who cycles in Dublin every day I was very pleased to make these badges for I Bike Dublin. December is here so we'll finally allows ourselves to mention the C-word. We were delighted to print these fantastic retro Christmas badges for the Little Museum of Dublin. The Little Museum tells the story of the Dublin through objects donated by the public. Today there are over 5,000 artefacts in the collection. These badges replicate a badge from their own collection from the Switzers Department store which closed in 1995. Switzers was famous for it's christmas windows and people would make the trip to the city centre with their children just to see their window displays which featured moving characters. Visiting Santa at Switzers was a big thing. RTE's archive website has a video of Santa arriving at Switzers in the 80s. He appears to be travelling in a giant boot or maybe it's a roller skate. 38mm campaign badges printed for Galway Traveller Movement. We recently made some badges for Homes for Unwanted Greyhounds for use at an event called Ireland's Family Pet Expo. 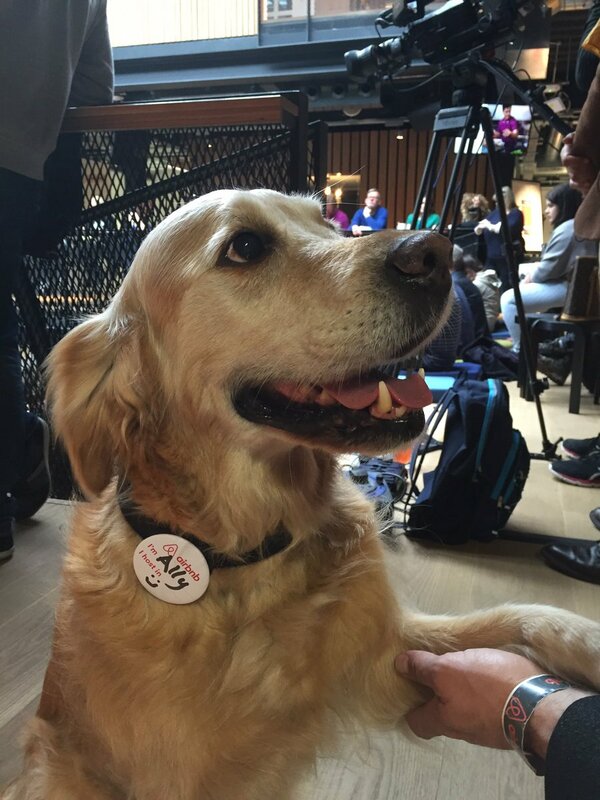 Here's a dog called Kit modelling one of the badges. This isn't the first time our badges have been word by dogs. Below is another image from an Airbnb event for hosts. Our clip badges are ideal for use on dog collars or anytime you are worried about the wearer being spiked by a badge pin such as badges for young children. Below are some 58mm clip badges recently printed for the Rock Jam School of Music and Performance. We recently made some badges for the National Treasures roadshows. National Treasures is an archive project which includes a new RTE TV show focussing on"the everyday objects that explore the history of the island of Ireland over the past 100 years." The project includes an online archive and will culminate in an exhibition at the National Museum of Ireland. Some badges we recently made for a troop of scouts using a design hand drawn by one of the children. We recently printed these 58mm badges for the Galway band O Boland. Badges are a great merch item for bands to sell at gigs. BadgeMaking.ie didn't produce these badges for the TypeCon 2016 conference in Seattle but they caught my eye on the Identity Designed blog. It's a very nice example of badges being used as a striking element within a visual identity. Badges have always been a very popular merch item for bands and musicians to sell at gigs. We've printed badges for a range of Irish musicians including these 25mm badges recently made for the Galway based band Majestic Bears who describe themselves as a 'Grizzly Irish Folk Band'. You can listen to the Majestic Bears on Bandcamp. We made these badges for a sports club who were having their annual awards ceremony. The badges are 58mm in diameter and each features the club's logo with name of the award and year. Badges are great as a cheaper alternative to medals if you are on a budget. Badges make the ideal giveaway item to promote your brand at trade shows. They're an high visibility item that will be seen by many people throughout the trade show and beyond as they are worn by visitors to your booth. 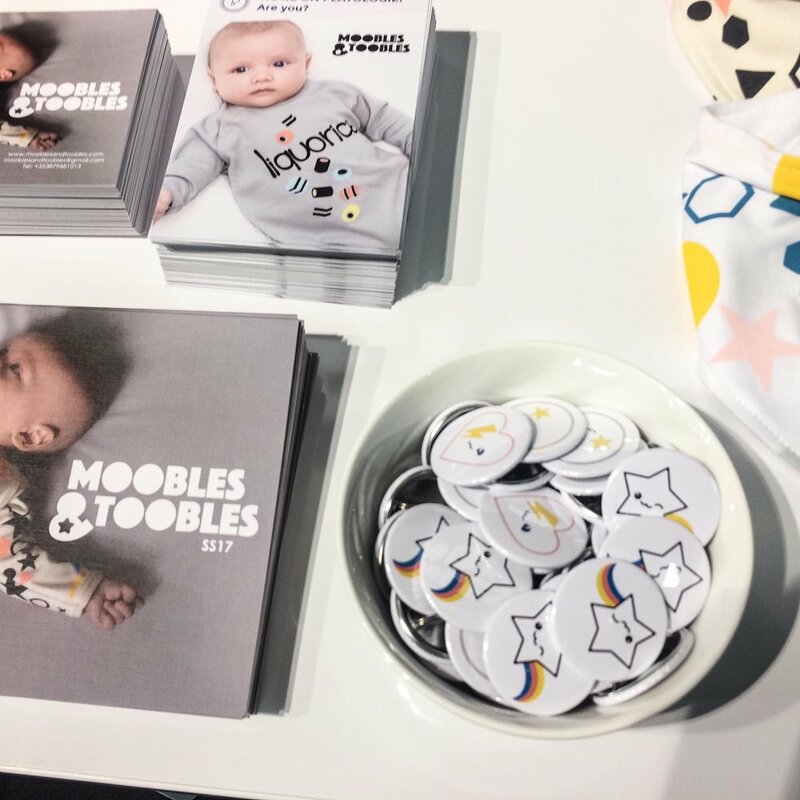 Pictured here are some cute 38mm badges we printed for the Irish baby clothing business Moobles and Toobles. They took the badges to the Playtime Trade show in Paris where they were promoting their screenprinted organic fairtrade cotton baby clothes. We recently produced a set of three Irish LGBTQ badges which we sold in the lead up to Dublin LGBTQ Pride to raise funds for GLEN. We sold 163 badge sets to 86 customers in 4 countries. 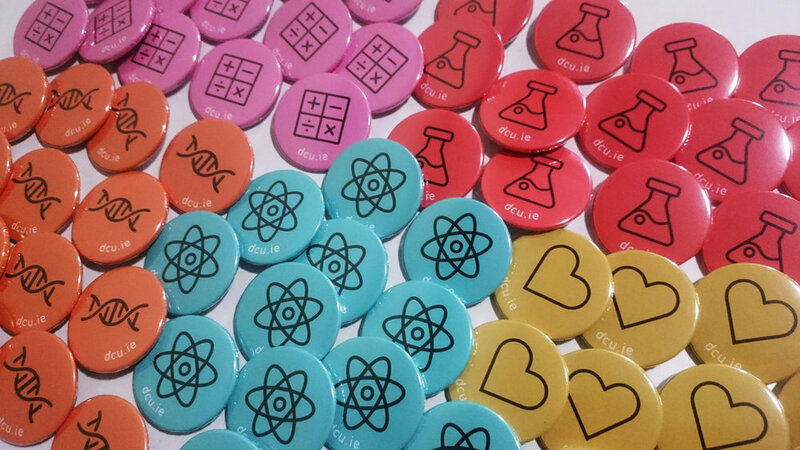 The largest amount ordered by a single customer was 20 sets of badges! The campaign has come to an end and we're delighted to announce we raised at total of €719 for the charity. Thanks to all who contributed and we hope you've enjoyed the Pride weekend. Also a big thank you to Broadsheet.ie, Lovin' Dublin, Her.ie, FrockAdvisor and U Magazine for featuring the badges. Below is an image of one of the badges out in the world. If you bought a set please share your photos with us on Instagram, Twitter or Facebook. We often print badges for various clubs, teams, and societies of different kinds. There a great giveaway item for members and a way to spread awareness in the community or fundraise. Pictured above are some badges we printed fro Galway MTB mountain biking club. Dublin Pride is coming up from 22nd- 26th June 2016. So we've decided to make these badges available for a short time with all profits being donated to GLEN – Gay + Lesbian Equality Network. The badges are 58mm in diameter and come as a set of three for €6 including postage within Ireland. Update: The badges are no longer available. Thanks to everyone who purchased. I now have some maths to do and will shortly be posting details of how much was raised. We can now provide custom printed badges and magnets with stickers on the back. This is a great way to add a logo or to some additional text like a website URL or contact details which you may not want on the front of your badge. The stickers are 24mm or 12mm in diameter and can be printed in black only. The image above shows a 24mm sticker on the back of a 38mm magnet. We recently made some badges for a communion and received a lovely 5 star review on our Facebook page. Great badges and super efficient, Niall did exactly what I had in mind all though email and I had them in 3 days!!! Some service! Thanks Hazel, glad you were pleased with the badges.